Michael Jackness is probably an eCommerce name you’re familiar with. If you don’t know him from our private community or from being a past guest on the podcast here, you probably listen to him over at his podcast EcomCrew. Or maybe you’ve heard him speak at a conference or have had the chance to take one of his eCommerce courses. He’s the true definition of an eCommerce influencer. Mike knows firsthand how crucial it is to build an engaged audience from the start. Today he shares the biggest mistakes he’s made and how to avoid them, along with winning strategies for connecting with an audience. Hey, guys, it’s Andrew here, and welcome to the eCommerceFuel Podcast. Thanks so much, for tuning in to the show today. And joining me, I had a little doubleheader episode with a good friend of mine, a guy who’s been a super, a very integral part of the community for years now, someone who I love watching what he does because he is just a brilliant guy in eCommerce, and in general, and that’s Mr. Michael Jackness from ecomcrew.com and many other businesses. So, Mike, welcome to the show, sir. Michael: Thanks, man. It’s good to be back on. I think I did this a year and a half, or two years ago, whatever it was. And it was the very first podcast I ever did, and now here we are. Andrew: Well, you were on recently, too. You’re becoming more of a frequent guest here, on “The Amazon Reviews” episode as well, so. Michael: That’s right. Yeah, I forgot about that. You had me on for a special segment. I forgot about that, yeah. But before that, I think it had been a while, and it’s really what kinda got me into doing all this to begin with. I really enjoyed it back then, and still enjoy doing it now. Andrew: Cool, man. I figured…we were talking about what we wanted to chat about on the show in kind of a more of a casual format, and one thing that came to mind, and it’s not exactly perfectly applicable to everyone listening, but I thought it’d be a lot of fun, if for nothing else than purely selfishly, and maybe I can take some of this occasionally given it’s my show, to talk about…we both have, you’ve done such an incredible job the last couple of years, especially the last year, building up ecomcrew.com. And if you’re listening and you’re not familiar with that, it’s Mike and David Bryant, his partner’s site, for really sharing what they know about building and running an eCommerce business. And you’ve built a community over there, an audience, you have a podcast, a lot of incredible content. And, you know, obviously, that’s something I’ve been, you know, something I’ve been doing for a while over at eCommerceFuel, as well. And I thought it’d be fun to talk about, you know, that process from both of our perspectives, how we built the audience, especially starting from scratch, the hardest part is getting that early momentum, and what we felt worked well, what mistakes we made. Just kinda behind the scenes into to how we’ve done that. And, again, probably not gonna be something that everyone’s gonna do directly, but I think hopefully, there’ll be some lessons, and some insights into building an audience even if it’s for an eCommerce business. Michael: Yeah, I think that just kind of fore-shadowing the next half an hour or so, as we talk about this, don’t turn this off if you’re into building, necessarily, a podcast, or a blog about ecommerce. There’s a lot of parallels here to e-commerce, and to, I think people should be doing with their e-commerce blog and content for e-commerce in general, that can be, at least there are some synergies here. So I think you should stay tuned and kinda listen through the whole thing. Andrew: Yeah. So, I wanna jump in, one thing I do wanna do before we kick off the discussion is we have two awesome sponsors for the show that help make it possible. Two companies that we’ve both used in some capacity or another, and the first one is Klaviyo. If you listen to the show, you most certainly know who they are, Klaviyo. They make e-mail automation powerful, and simple. Andrew: “He’s gonna talk about how he creates, you know, 40% of his revenue from Klaviyo.” And you corrected me as I was introducing you like, “No, no. It’s 50%.” You’ve used them for years, right? Michael: Yeah, we still use Klaviyo. We still get 50% of our revenue. It bounces between 48% and 52%, depending on the month, for ColorIt. We’re trying to get to that same number for all of our other brands as we grow them. But Klaviyo, that’s obviously not what I’m here to talk about, I’m gonna do a spot for you to help you with this, but it is the best email marketing platform for e-commerce. We actually just looked at switching, actually, because we’re getting tons and tons of emails and I was like, “Maybe there’s something else out there,” and we went through this whole process for a couple of months, and came back to Klaviyo. Not that we had anything really wrong with Klaviyo that we wanted to leave for, but like, just to see what else is out there, because I think it’s important every now and then, to re-evaluate. And we had heard some chatter in the forums and other places, about some other options out there. And the reality is, is that Klaviyo has always been, and still is the best of breed when it comes to email marketing for e-commerce. Michael: What is the right way? I never know. Andrew: I think it’s Klaviyo. I should probably check with them, giving their response for the show. Michael: I just screw up people. Like, whatever they say, I tell them it’s the opposite. So, I’m like, yeah, just to throw something, a little wrench in there. Andrew: Oh, man. Klaviyo, Klaviyo, however you wanna pronounce it, .com. Excuse me, ecommercefuel.com/klaviyo, and you can get a free trial with them. And then the second sponsor for our show is the team over at Liquid Web. And they do world class hosting across the board, specialized though, in WordPress, and especially in WooCommerce. So, if you run a WooCommerce store, and you are really worried about having a rock solid platform for your store, you absolutely wanna check these guys out. They have a complete hosted solution that’s engineered to make WooCommerce just scream, on a performance level, on a backup level, on testing all your plugins and your core updates, they’re phenomenal. So, I’ve been with them for, you know, I’ve posted all of my stuff with them for a while now, and I’ve been really impressed. So, if you’re looking for great hosting, and especially if you’re looking for great hosting for WooCommerce, check on that at ecommercefuel.com/liquidweb. So, thank you, guys. I appreciate the support for the show. And Mike, why don’t we kick things off? So, for you at EcomCrew, why did you start? I get these questions, and like, why did you start, you know, the blog, the podcast, building an audience there, sharing what you know? I guess, when did you start, and why? Michael: Yeah. So, I started a couple of months after I really got into e-commerce, after I had found eCommerceFuel. And I realized that, I don’t know, like we were just inherently kind of ahead of the curve with what we were doing, and that was cool to me. I mean, like it was definitely neat very quickly just kind of being ahead of the curve in e-commerce. So I think a lot of that comes from being in affiliate marketing, and in online marketing, and being an entrepreneur. I quit my job back in 2004, so I mean it’s been a long time. So, I had other experience that helped me just kind of hit the ground running with e-commerce, but it was fun. It was a totally different world, going into the eCommerceFuel forums, and talking about things with people, and realizing the community and the camaraderie in this niche, versus what I used to do, which was online poker affiliate marketing, which was…if you could think of like all the stereotypes of people that you would expect to be like in this industry, sometimes there’s stereotypes for a reason, these types of people weren’t the nicest. Everyone was going after the exact same thing, so like, you know, let’s say there’s 1,000 poker affiliates in the world, like everyone was trying to rank number one for online poker. That was basically…everyone was just a competitor. Versus e-commerce, it’s a totally different world. I mean, like it’s a very refreshing world. Like, almost nobody is a direct competitor, and you can help each other out without hurting yourself in any way, shape or form. In fact, I think that a rising tide rises all ships kind of thing happens. And for me, like I realized that pretty early on and thought, “This will be cool. I can document my journey, and talk about things that I’m doing here,” just kind of see where this goes. And that’s kinda what we did. There was no monetization angle for it, or any other thing at that time. Like, I just knew that if I started documenting this, that good things would come, I just didn’t know exactly what it would be at the time. The key was gotta stick with it. This can’t be something I do for three to six months and then just kind of give up on it. It has to be something that is done every week. And to this point, we have, basically, recorded an average of like 48 podcasts per year. Every now and then we do miss one. And now we’ve actually upped it to two per week, and I’m sticking with that schedule as well. So it’s, you know, consistency, constant pressure, has helped really build that audience. And what ends up happening is you eventually, at some point, get this hockey stick kind of growth that we’re experiencing now. Andrew: Yeah. When I think back on why I started it, it was, you know, I started writing in 2012. And it’s funny you mentioned like, not knowing what you’re gonna do with it, I kinda had the same thing. I didn’t know how, and what the long game would be, but I knew that if you had an audience of people who trusted you, interesting opportunities present themselves. In 2012, looking around the ecommerce space, there was a lot of people doing it well now, yourself, especially, included. Back then, people were writing about ecommerce, were writing about ecommerce from like a Fortune 500 standpoint, right? Like, nobody has written, very few people, I should say, were writing about it. Steve Chou was, at mywifequitherjob.com, but there were not many people writing about it. So, I said, you know, I thought, one, there’s a gap in the market, and secondly, it felt like it was a way where I had a little bit of expertise from, you know, from some years of running ecommerce businesses, and yeah, but not knowing how that would look. But I thought there’d be an interesting opportunity. And I enjoy it too, of course, like anyone doing this for, you know, more than a couple of years. You have to enjoy it, otherwise, you’re not gonna stick with it. But, yeah, that was kind of my motivation, and philosophy. Maybe we can…I’d love to get your thoughts on philosophy, starting up. Because my philosophy was, I didn’t try to monetize anything for the first year. My core goal was to deliver value, build up an audience, build up an email list, gain credibility, and make connections in the industry. That was all I focused on for a year. And probably 60% to, two thirds of my time was probably spent on just doing that for a whole year, which sounds crazy, but I felt like it was the best way to try to, you know, make a name for the brand, and build connections early on. So, did you have that? What was your mindset, kind of for the first 12 months? You know, so the message has always been very real. It’s like, “Business is hard. I can try to help make it easier. I’ve made this mistake, don’t make this mistake too.” It’s hard to be self-deprecating and talk about mistakes, as people wanna come off as this omnipotent being that is trying to sell you a course, and if you follow that information, you’ll be an instant millionaire like them. And that never actually really works. So I was more concerned about what doesn’t work, and then took the exact approach. Sorry, not what doesn’t work, but what I didn’t wanna be. And then took the exact approach that you just said, which was to just do it for a period of time before even thinking about like how is this going to make me money, because that isn’t always the be all, end all in life. Andrew: How did you build early momentum? So, you register ecomcrew.com, you don’t have anything up there on day one. How did you get traction? Michael: So, I call this phenomenon, writing to yourself. That’s basically all you’re doing for the first like, three to six months, where you’re putting up articles, and no one’s reading them except for you, really. At the end of the day, I mean, you’re not getting a lot of traffic. And this is where most people give up in blogging, because they don’t see the instant results. Like, they can’t wait for Facebook ads, or Google AdWords, or whatever it might be, and they just stop. Luckily for me, I mean, because of previous experiences of doing this over many years, you know, I wasn’t worried about that. And I knew that if I wrote really good content and articles, eventually, some things would take notice. And the very first thing that got any attention was an article that I wrote about BigCommerce’s check out, which was basically broken, and still is in a lot of ways, ironically. They actually linked to it, and talked about it, and then called me and tried to work through what they’re likely developer on how to fix some of these issues. And these were all the things that people were looking for. So that post, in general, like, was the first thing that got any real attention, and got any organic links. And then from there, like, once you kinda have your first dose of that, it gets a lot easier from there. But certainly a tough row to hoe until you can get to that point. Andrew: Yeah. For me, I feel like early traction, there’s two things that I tried to do. One of them was before I wrote a single blog post, I spent 2 weeks holed up in a cabin in Arizona for 8 hours a day, doing nothing but writing this 70-page PDF guide to picking an e-commerce niche, and like getting your business off the ground. I wanted it to be something where I could reasonably charge $100 or so for it, but I wanted to give it away as a marketing mechanism. And I figured if I wrote something that was just phenomenally good, and poured a lot of time in for free, that could act as a marketing thing for me, and so I put up a landing page for that. I mean, I think I downloaded probably, oh, man, tens of thousands of times. And that helped a lot with the early traction. The other thing that I focused on was guest posting early on, especially with Shopify. So, this is back in 2012. Everyone knows Shopify now, and a lot of people knew Shopify then still, but they were still up and coming, but they had probably one of, if not the best e-commerce blogs especially for the small medium business size space. And I spent, after I put four or five posts up on the blog, that, you know, that probably took another week and a half of really high quality one so that it wasn’t a graveyard, getting to know and building a relationship with the content team at Shopify to be able to drive a bunch of traffic, and also build some SEO as well. So I remember looking at my email opt-ins and analytics, this is years ago, but I think just my posts from Shopify…I did, I don’t know, probably 4 or 5 over the course of, you know, a 3-month period or a 4-month period, and I think that generates something like 40% of all of my opt-ins from my list for a couple of years. So, those are the two big things that help to get…And once you get that early momentum, you can start seeing some…it can be kind of a fly, not flywheel, it’s kind of a buzzword, but I’ll use it. The more content you create, it starts getting shared by people who come in for those big channels. But I feel like having a couple of big sources of momentum early on are pretty crucial. Michael: Yeah. I mean, that’s one thing I guess if I was a look back at, that I do regret a little bit for EcomCrew, because we weren’t taking it very seriously in the first year, or 18 months, even, so we just not really got up some of our truly magnetic, value first type stuff like you’re talking about. We went a little bit overboard. We made some video courses for three different topics that are all free behind just an email off, so give us an email address and then you get access to these courses that I would, you know, would generally, like you said, charge $100 or $200, whatever dollars for, and then you have someone’s email address. And it’s the same exact concept that we’ve applied to ColorIt and, like, all of our other brands. You know, that whole value-first marketing, right? It’s a lot easier to build trust with somebody by giving them 100-page PDF that legitimately, like, can help them create a business and put some money in their pocket, and the next time they’re looking for something where they are looking for more advice, or training, or to join a community here, or whatever it might be, like, you’re still on their mind. And that second conversion where they are pulling out their credit card is a lot easier at that point, because you’ve developed a relationship with them. Andrew: Maybe you can talk about some of the businesses, or the kind of audiences that has matured a little bit, or we’ve been doing it longer, some of the biggest wins and losses that we’ve had. We’ll start with the losses to make it interesting. Mike, what have been some of the biggest mistakes you’ve made in kind of building up the brand over there, over the years? Michael: I think you kind of alluded to this just a second ago. By far and away, I think the thing that looking back at it now that I regret more than anything, is not collecting email addresses sooner. And this is as the email guy, like, I mean, as you just said, we talked about this at Klaviyo, I’m the email guy in ecommerce. I mean, I’m always thinking email first, and long-term relationships first, when it comes to this stuff. I honestly just didn’t care, at least, I didn’t care enough about to spend the time to just put a simple “Sign Up” form on the blog, and, you know, probably, were missing out on 10 to 20 emails sign-ups a day, that over the course of a year, that adds up to, you know, 5,000, 6,000 emails on a list. Now I look at, when we released the course, how many people converted off of our list, and if I had an extra 6,000 people, like what they could have meant if I had just spent five minutes of my time to throw up a stupid email capture form on the site. So, that’s probably my biggest regret, the biggest mess, to this point. Andrew: Interesting. For me, I would say it’s…I think it’s funny, it’s kind of the inverse of yours. I felt like I was really good at building an email list early on, but I made a couple of mistakes. One, I didn’t nurture that email list probably as well as I should have, and so at one point, my list, the number on there was like probably in the 50,000-ish range for people. And then I had some deliverability issues, some spam issues, where, I wasn’t spamming people but because I wasn’t keeping my list super clean, I got hit with some penalties and kind of swung the other direction, and kind of really curtailed my list down to, you know, about, you know, 10,000 to 15,000 really active engaged people. Which is a good thing to do, but I think I overreacted. I think I probably cut out a lot of people that, potentially with a little bit more engagement or targeted emails, I could’ve at least kept on the list, and they weren’t hurting me. And then kind of in the second half, like the last two years, I have not been nearly as good about building up that email list. Like, the offers on eCommerceFuel haven’t been quite as, I haven’t had as, you know, if you’re talking about putting that, I have a pop up list and some auto responders, and it kind of segments people based on if they’re more experienced or more beginners. But I don’t feel like I’ve put the time and the energy to keep that list, continue to grow it well. And then also, you know, sending to the list. A lot of times, I’ll send stuff out, but I feel like I could’ve done a better job of engaging and nurturing that email list. I don’t know if you feel this way, but you can’t just set it and forget it for, you know, for years with those kind of email lists. You’ve got to be nurturing, and like, anything. And I haven’t done as good a job of that recently, I think. Michael: Yeah. I think a minimum of once a week to email people on a list. If you can’t email people at least once a week, then you probably shouldn’t even bother collecting email addresses to begin with. So, we email at least weekly for everything that we do, whether it’s ecommerce specifically, or a blog, or just a content site, or whatever. Yeah, so I think that you’re right. Absolutely should be continuously engaging your list. Andrew: Here’s a question for it. So, it’s funny you say once a week, so for the last, I don’t know, six months or so, we’ve been emailing, because we have weekly podcast episodes come out as well, and we started emailing weekly when new episodes come out. I actually just put the kibosh on doing that for a couple of reasons. One, because thinking through like, well, podcast is such a different medium versus emailing. Granted, we link up, I guess kind of the rationale is hey, let people know the podcast is live, but also send them the transcript if they wanna read it, because I think a surprising number of people read it, based on just talking with people. But the other thing is, I’ve noticed even on that list of pre-qual people, just the, and maybe this is just a function of email getting harder and more competitive, and G-Mail throwing so much stuff to the Updates and the Promotions box, but I’ve noticed that the more I send, a lot of times, like those rates, I feel like they’ve been going down a little bit. And whereas I think there’s someone like, I’ll just use like Rob Walling, for example, of “Software by Rob,” startups, the rest of us. He’s in the SaaS space. He doesn’t send a lot of email, but when he does, I’ll usually, because I see his email, I know he doesn’t send a lot of stuff, and usually, it’s something pretty interesting when he does send it. So, I’ve been kind of recently, more flirting with the idea of sending less email. But then at the same time, you have to balance that with, you know, making sure that, you know, people don’t forget you and some of the email deliverability metrics. So, I guess two questions for you, Mike, thoughts on that. And then, do you send out emails to your audience for every podcast, or do you tend to focus more on written stuff for emails? Michael: I’m gonna first ask you a quick question as a follow-up to what you were just talking about. What is it that makes you open up that one email a month that you get from that other site that you were talking about? Michael: You fell right in my trap. That’s the key, right? So, I mean, I think that that’s the hard part. Can you come up with something quality enough, every week, to get people to wanna open up that email, rather than just sending out just, like, pretty lame updates? And we used to do the same thing, which is like, “Here’s our newest blog post,” or, “Here’s our podcast.” So, the answer is, no, we don’t really do that anymore. And you and I talked about some of this. We’ve been trying all kinds of things. We tried like a weekly news show that we were doing for a little while, that we put out a three to five-minute clip of what’s going on in the industry. We’re still trying to figure out what gets the highest open rate, but we’re trying to get to 20% open rates on our weekly email, that’s like our target, and we’re pretty close. There are above 15. It grows, and we can keep it at that rate, I think we’re doing a decent job. It’s, you know, basically more than double industry average at that point. Andrew: What about your biggest wins so far? It could be a strategy, or maybe even a couple of tactical things that you’ve done that have had outsized results. Michael: You called him a friend. Andrew: Acquaintances, maybe. Yeah. No, I love Steve. I love just roasting him even more than I do calling him a friend, so. Sorry. Michael: His big thing always is that like, “The only reason I do this is to meet people,” you know, kind of thing. Obviously, it’s not just that, but like he’s always joking about, like, it’s kind of the big thing. And I’ve kind of come to realize that he’s right. I mean, that’s like by far and away, the biggest win of this. It’s like if it weren’t for starting EcomCrew, and doing the podcast, and speaking at events, like, I never, like I might have met you, but we wouldn’t have become good friends. Like, I might have just shook your hand and then like, “Hey, good to meet you.” I wouldn’t have met Steve, or about someone else, or just like all the other amazing people in this industry. I mean, it’s really awesome to be able to be hanging around people that are way smarter than you. I don’t know why they associate with me, but it’s pretty cool being around these really smart people. And for me, that’s like by far, the biggest win. It’s really neat to have these relationships with people that you can talk to about things that are, you know, a lot of other people don’t understand. Yeah, I mean, it’s by far and away, like been the most rewarding thing for me. Is just all the people I’ve met. Andrew: Yeah, I have to echo that too. It’s been amazing. I think about my good friends now, and I would say probably half of my very good friends are in e-commerce community, kind of just generally, which kind of blows me away thinking about it in retrospect. But yeah, it’s building, you know, a platform like that, and a podcast, especially. I don’t know about you, but podcasting is a great excuse to be able to, especially if you have a little bit of an audience that you can use to try to convince someone that you don’t know, that, you know, that they should spend an hour with you, because hopefully, it’s gonna be beneficial for something that they’re doing, because you can amplify what they’re doing to other people. But, yeah, it’s an amazing excuse to be able to get in touch and network with people all around the world, that otherwise, you would just, you know, it’d be tough to do. Michael: Yeah. Can I throw in well one more big win there? Andrew: Of course, go for it. Michael: Just a second win. The only thing that like is a huge win for me is just, you know, when I go speak at events now, just, you know, all the people that will walk up and be like, “Oh, you’re Mike Jackness. I listen to podcasts, and you help me in X, Y, Z way,” or whatever. You know, I’m just at a point in my life where like that actually means more to me than the making money. And it’s really, really flattering, humbling, satisfying, all these adjectives, to hear how you did something that didn’t hurt you in any way, but made a substantial difference in someone else’s life, is really freaking cool. And that’s the other thing that I really thrive on now, doing this. It happens more and more as we get a bigger audience, and as I go speak at more events. Like, that happens more frequently, and like, I gotta say, it never gets old. It’s not an ego thing, it’s something else that’s like, I don’t know. There’s all these cliché sayings about how helping people is better than helping yourself, or whatever, and other things like that, but it’s true, man. Like, it’s definitely really, really cool, and it helps keep the fire going to keep doing this stuff. Andrew: Yeah. No, I hear you, man. Any more wins on your side before I throw one more in there? Michael: No, I think those are really the two big ones. The other stuff isn’t really as important. We’ve had some wins as far as releasing courses now, and they’ve done well financially, but again, that’s like not the, that’s not the main reason we do it. Although that also is humbling as well, that you get people that wanna actually not only listen to you for an hour like you said, but also give you money to have you help them in their business. And then the testimonials, and the things that we get as a result of that also make me feel good, right? I mean, it’s like we don’t get like, “This was a scam. I want a refund, you tried to rip me off,” emails, because we don’t approach things that way at all. The emails that we get are just awesome to hear, and so I guess that’s like a half a win, I would say. But those are probably the two and a half that I have. Andrew: Thanks. The other one that came to mind for me in terms of, a lot of it is about consistency, about just, you know, trying to deliver value over time. But if I had to come up with like short-term things, and even these aren’t short-term things, but things that I’ve had outsized impact, I think it would be developing really in-depth content, and especially if you can do it in a very unorthodox way. So, two things come to mind for me. One is when I put together a big piece of content that kind of outlined when I sold the business transparently, and I auctioned it off over auction. I won’t go through too many of the details, because I think some people might be familiar with it. But it was something that hadn’t been done before, and it was a little risky. I could’ve lost a lot of money, and it was a little unorthodox. I put it out there, and it was really scary, but it paid huge dividends because it got picked up on “Hacker News,” earned a lot of back links, earned a lot of email addresses from it. That was cool. And then also thinking through the State of The Merchant, which I just released the second one, I’ll be doing an episode here shortly on it, or maybe it’s already aired. Michael: So good, man. Like I just want…it’s…seriously, it’s amazing. Andrew: Oh, thank you. I appreciate it. But that kind of stuff, like it takes, I mean, that’s probably like close to a month’s worth of work and thousands of dollars, for one piece of content, right? Andrew: But at the same time, when I look at last year’s State of The Merchant, the number of links, people that have reached out to me, kind of connections I’ve been able to make because of that, it’s been tremendous. So I think, you know, looking back, if you can spend less time, and I’m probably pushing the choir here as somebody who puts out a million podcasts, but you can spend less time doing more epic pieces of content. And this gets harder, right? Like, especially in 2018 where content marketing has been around for a while, and people are still trying to come up grounding in content on the web. But for me, those have been some of the wins, I think, that have stood out. The difference between those two pieces of content is like when I get the, I mean, the 1,000-word blog post that someone got hired from another country to write, I feel literally pissed after reading it. Like, I just wasted my time. Versus when I get done reading the State of The Merchant blog post, which I just, literally, just read yesterday. I feel like my life was enriched in some way by reading that, and like I wanna share it with people, and I wanna talk about it, you know, the rest of this year because there’s just some amazing stats in there that will help my business, and my career moving forward, because it’s really interesting. And it helps me relate to some of the people, like I can see where I fall in with all that. It’s like you can just see all these amazing positive things that come out of that, versus what people try to do, which is the least viable, or the minimal viable thing, to just be able to say, “I wrote a blog post.” It’s a big difference, and the results are very different as well. Andrew: Mike, we have to wrap up in a couple of minutes. But you have, speaking of epic content and stuff that you’ve been working on, you and Dave have been working on, you alluded to the fact you released a couple of courses. I’ve taken a look at both of them, and the stuff you put out is phenomenal, apart from just the content, knowing you and your experience. Talk quickly about the two courses you put out, what they are, what they cover, and who they’re a good fit for. Michael: So, we have two courses out. Right now, we’re working on a third. And they’re basically gonna be like our three core classes. The first one is “Importing From China,” so we go through all the things I think that people are scared of, or apprehensive of, when importing from China, and really try to give an insider’s perspective as someone that’s been to China now six times. I’m about to get on a plane here in a couple of weeks to take my seventh trip over there. We’ve imported millions of dollars of stuff from China, and I’ve learned a lot along the way. Like, I am a very self-taught type person, so, you know, I figured out a lot of things on my own, which means I made a ton of mistakes. So a lot of what we talk about is just things not to do, but also just like how to negotiate better with Chinese manufacturers, and how to actually get the stuff imported, and how to deal with customs, and just generally like how to find manufacturers and get stuff from China to the United States, or other parts of the world, is one of the courses. The other one is “How to Build A Seven-Figure Brand.” So, you know, our goal is to help 1,000 people build a 7-figure brand over the next couple of years with EcomCrew. This course is really about the types of products to pick, like how to not pick products that aren’t going to sell well, how to pick the products, or, you know, just have certain criteria and stuff that are gonna put you in a better chance for success, or how to deal with building an actual brand and not just selling a bunch of random products. Packaging is a big part of what we talk about there, and other factors like that that help with that whole lifecycle of building a seven-figure brand, and not just selling random crap on Amazon, or do the latest get-rich-quick scheme. That is not what we’re about at all. And then the third course that we’re working on releasing, or what should be out probably a few weeks after this podcast comes out, or whenever this comes out, gonna be on Amazon, like how to launch a product on Amazon the white hat way, and not do any scammy-type things that are going to get your account banned. That’s like the big thing that we had worked on for the last year and a half, is how to devise a plan for our own business that allows us to consistently launch products on Amazon without like using super URLs, or coupons, or review platforms, or launch services, and all this other crap that I think is gonna be a big day of reckoning for people at some point in the future. Yeah, so those are basically the three ones that we have right now, and there are some others in the works as well. Andrew: Yeah. You did such a good job with your products. They’re all, I think, at the core of what you could parallel. I mean, across all three of those courses would be just coming out with a really high quality, great offering. And you were kind enough to give us, we had a son recently, and you give me a really cool little onesie for him, and we’ve actually…I mean, it’s so good that, you know, I went back, and you went back and bought another one for Theo, because it’s just like it’s super high quality cotton, like packaging on it, you feel like you’re getting a premium product, because you are. Like, it is a premium product, but you present that with the packaging. And that’s kind of a, if I had to, I’m kinda putting words in your mouth, but you obviously know how to do that really well, and it’s kind of a common theme that I imagine goes for all three of those courses. Michael: Yeah. I mean, you’re right, you definitely are putting words in my mouth. It all stems from, you know, our core values of things that we actually literally have on the wall here. You know, the number one thing is like we want to develop a product that not only would I use, but I would personally, legitimately wanna give a five-star review for, and wanna tell other people about because it’s just that good. That’s our baseline, and it’s not, how can we make the most money? You know, I think that most people are approaching…and obviously, business is there to make money. I’m not begrudging people making money, we try to make money in our business too, but it literally is not the first thing we think about it. We know the rest will come, and hopefully, that kind of shows through. I appreciate their repeat business. Andrew: Oh, you give me so much awesome stuff over the years, the least I can do is buy a onesie. Michael: Nice. I was wondering why we sold one of those last month. Andrew: Yeah, right. If I had to bet, I would imagine you’re moving a lot of those, so. Well, Mike, where can people find, of course, ecomcrew.com, and that’s ecom through to the courses section, where is the best place to find those three courses? Michael: Yeah, so it’s ecomcrew.com, is the blog website. The courses are also on there. That’s also the name of the podcast. We’ll put together a link for eCommerceFuel members, or people listening to this podcast for a special offer, throw that on the show notes or something. You can mention that in the outro when we record that later, Andrew, and give people a special offer just for the eCommerceFuel community. Andrew: Wonderful. Well, Mike, it’s always fun to catch up, to talk shop, and selfishly, at least for this episode, kind of go back and talk about how we built respective audiences. So, thanks for coming on, and looking forward to doing it again sometime. Michael: Definitely, and I appreciate it. Andrew: That’s gonna do it for this week’s episode, but if you enjoyed what you heard, check us out at ecommercefuel.com, where you’ll find the private vetted community for online store owners. And what makes us different from other online communities, or forums, is that we heavily vet everyone who joins, to make sure that they have meaningful experience to contribute to the broader conversation. Everyone who we accept has to be doing at least a quarter a million dollars in annual sales on their store, and our average member does seven figures plus in sales via their business. 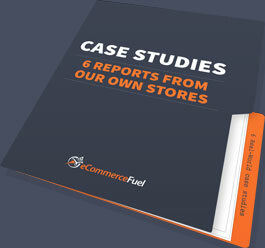 So, if that sounds interesting to you, if you wanna get, you know, connected with a group of experienced store owners online, check us out at ecommercefuel.com where you can learn more about membership, as well as apply. And finally, Liquid Web. If you’re on WooCommerce, if you’re thinking about getting on WooCommerce, Liquid Web is the absolute best hosting platform for three reasons. One, it’s built from the ground up for WooCommerce, and optimized by some of the best industry professionals in the WooCommerce and WordPress space that really know the stuff. Want to connect with and learn from other proven eCommerce entrepreneurs? Join us in the eCommerceFuel private community. It’s our tight-knit, vetted group for store owners with at least a quarter million dollars in annual sales. You can learn more and apply for membership at eCommercefuel.com. Thanks so much, for listening, and I’m looking forward to seeing you again next time. Can you please tell me how can i download ebook:Grow Your Store to 7-Figures and Beyond? I have entered my email but did’nt got any new email! Building an early momentum for an eCommerce store is very crucial. You not only have to run your business but also to scale it at the same time. For a new eCommerce store, it is not that easy to start making initial sales until they have a great product. I have seen eCommerce startups starting up and failing because of inefficient planning. I recommend keeping revamping your marketing plan to adopt the market circumstances. Now this is a very complete article that covers all the essential aspects of building a solid audience for any e-commerce shop. Many niches in the e-commerce space are highly competitive, and thereby you need to make your customers loyal, and thus customer support is vital for your success. Attending their complaints, answering their questions, and all in all, making them feel important.